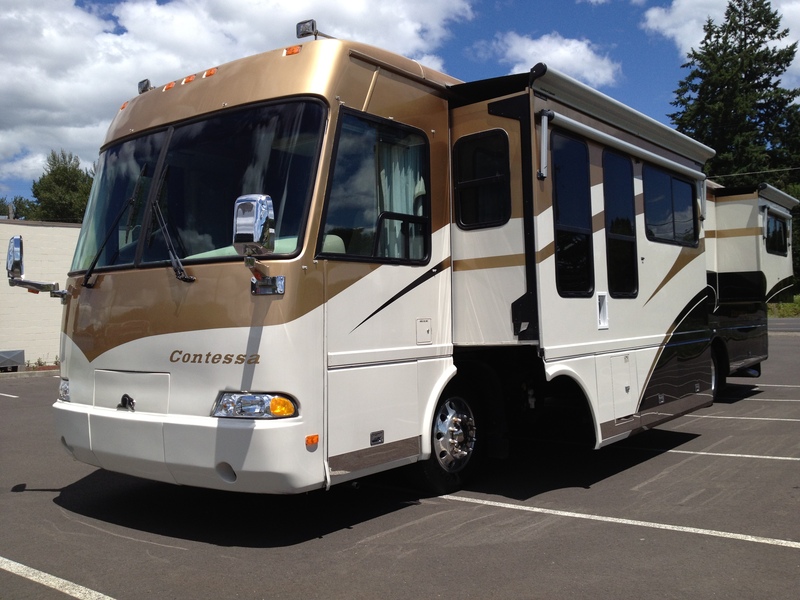 2002 Beaver Contessa Tuscany 40′ 3 triple slideouts that is in excellent condition. Full Body paint, 370HP Cummins fires right up and runs excellent with plenty of power to pull your car/boat behind. Touch button Allison Transmission, shifts like new. The coach is gorgeous and cost approx. $268,000 New! My reserve is set very low and this coach will not last! Coach is very luxurious and in great condition! Only has 312 hours on a Onan 7.5 KW Diesel generator that runs perfect. Coach has beautiful paint, keep in mind it is still a little older so she will have various chips, and little scratches but nothing serious. Very well kept. Coach has very nice storage compartments that scream quality when opening and closing on outside with nice chrome trim. The awning is Carefree one touch that works flawlessly. Tires are in nice shape with plenty of tread, and no cracking. This is one of the most quietest, and non bumpy rides you could want in a diesel coach, Magnum Chassis. Rides like a nice cadillac. Back up camera, Automatic leveling jacks, exhaust brake, power mirrors, cruise control, nice working A.C in cab. Coach offers three slides that work nicely and add lots of room! Beautiful leather couch that folds into bed in living room, custom lighting throughout, nice cabinets, Convection microwave, Dual side by side fridge Freezer built by Norcold that matches cabinets. nice stove, Washer dryer combo, Has privacy bathroom, nice shower with skylight, Queen size bed, Dual Duo therm A/C units on top, solar panel on roof, So much more! Please note In Nada Book it shows this model wasnt available in 2002, because there was no Triple slide units built back then. Although there were, This coach is titled and built in 2002 but is exactly the same as the 3 slide-out model in 2003. This coach book should be booked out as a 2003 and not a 2002. 370HP Tuscany 3 slideouts! This coach is turn key ready to go! Call 541.301.6862 Buyer must pay full balance within 3 days of end of auction. Coach is sold in as-is condition and I encourage potential bidders to come look prior to bidding if possible. For faster response please call. Thankyou, and good luck on bidding! Coach has Clean and Clear title Please Note this coach had $34,300 added options! Such as The engine package Cummins 370HP a $14,700 Hydro-hot heat & water system Super advanced Diesel powered and electric radiant heat throughout coach That add alone was $7,280 dollars that works excellent! Never run out of hot water! System was refurbished in 2011 over $4000 in receipts in hand. Also has Four door 12 CU ft Norcold Refer with Ice maker. $2100 add, Diesel Generator 7.5kw super quiet $4340, Chrome rocker trim $770, Air brakes, full length mud flap with logo $735, Care free power shades $525, pilot side ultraleather sleeper sofa w/DR $1540, Pilot and co pilot ultra leather power comfy seats $770, Have original sales Writeup Original owners paid over $268k! I have all service records, all manuals, This is one beautiful coach!